All donations to the Fondazione Piero e Lucille Corti are tax deductible for Italian residents and firms operating in Italy. Deduct 26% of the donation amount from your gross tax, to a maximum of €2,065.83 (sec. 15, subsection 1 letter i-a of Presidential Decree 917/86). 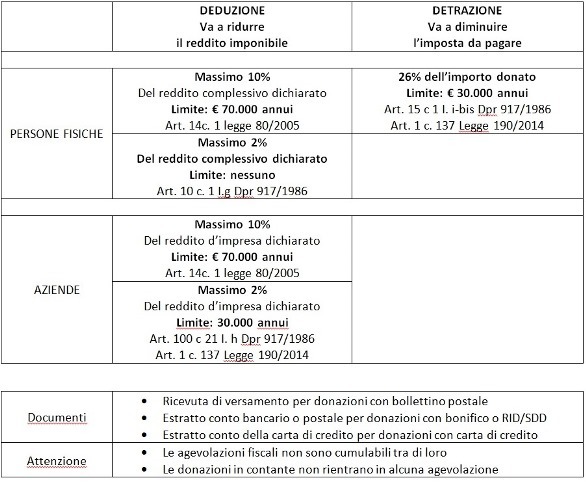 Deduct the donation from total declared income up to 10%, to a maximum of €70,000 (Bill 35/05 converted into Law no. 80 of May 14, 2005). Deduct donations to a maximum of €2,065.83 or 2% of declared business income (sec. 100, subsection 2 letter h of Presidential Decree 917/86). Deduct donations from total declared income up to 10% to a maximum of €70,000 (sec. 14, subsection 1 of Bill 35/05 converted into Law no. 80 of May 14, 2005). The credit card statement issued by the managing company in cases of donations by credit card. Cash donations are not eligible for tax deductions. so we will be able to thank you.